Make someone's day unforgettable by sending them this cheerful and colourful bouquet made from yellow roses, yellow germinis, red carnations and white alstroemeria. 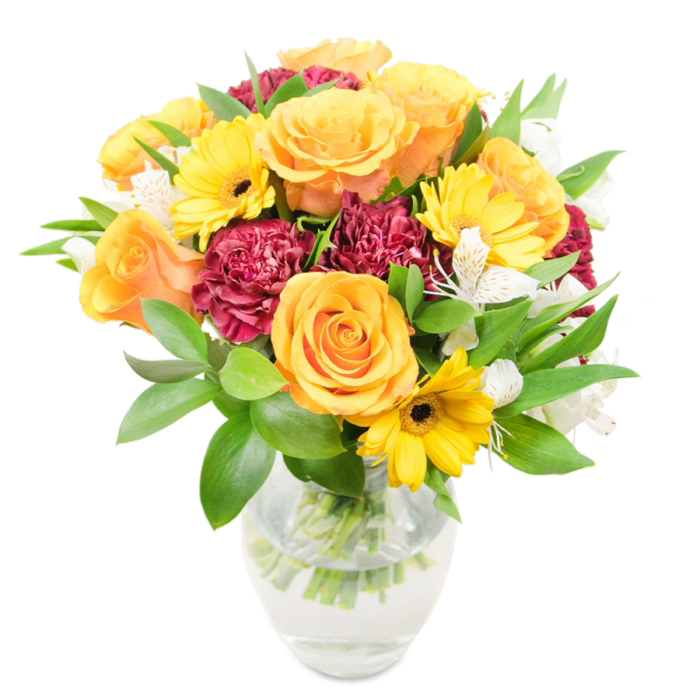 Its marvelous design will make everyone love this bouquet! Original bouquet pictured. Original bouquet contains 13 stems. I found ordering flowers very easy, and the flowers that arrived were absolutely outstanding quality. Imagined them to deliver great flowers but the bouquet was out of this world! Amazing! My lovely wife was left speechless when she saw the beautiful bouquet. Good job Handy Flowers. Keep up the great service. I liked the flowers very much. Thank you. What a nice surprise it was to receive this vibrant bouquet! Thanks for the wonderful arrangement and the kind attitude! Definitely bringing a smile on your face when you see it! Ordered this bouquet to be delivered in London and the delivery was made promptly which was great. The bouquet I got looked exactly like the one on the pictures – fresh and stylish. My significant other loved it! When I saw this bouquet I was mesmerised – I just had to order it! It arrived on the next day and after over a week, it is still adorning my living room, as fresh as ever! I needed to order a bouquet for the next day, as I had forgotten an important anniversary. This online flower shop came to the rescue and delivered this lovely bouquet made from fresh, vibrant flowers right on time. Thanks!